Currumbin Valley and Tomewin Mountain Gold Coast hinterland accommodation, B&Bs, cabins, luxury couples accommodation and homestays. 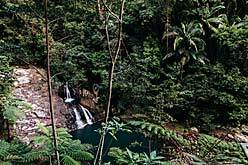 Currumbin and Tomewin Gold Coast hinterland accomodation, tourist information and history. Straddling the Queensland/New South Wales border about 20 kms inland from the twin towns of Tweed Heads and Coolangatta, the European history of the Tomewin region dates from the mid 19th century when the first settlers engaged in timber getting (cedar and rosewood were pre-dominant), cattle grazing and banana growing. Tomewin became a resting place for the horses on the Cobb and Co. coach run between Murwillumbah and Nerang, which was the inland route between the towns of the colonies whilst the Tweed River was a barrier along a flat coastal route. Connecting the Currumbin and Tweed valleys, the steep terrain of the route was a feature of any travel along Tomewin Road. Mount Tomewin has an elevation of 457 metres (1,500 feet) and with most of the ridge at about 335 metres (1,100 feet), logs and other heavy freight needed to be tied down during transport by horse and wagon. Present day Tomewin has seen the general demise of farming with only a few holdings of bananas remaining and the area given over to smaller subdivided lots where hobby farming is practised. Exclusive B&Bs and holiday home rentals take advantage of the spectacular views provided by the hillside locations and increased demand for secluded accommodation from weary and stressed out city dwellers. Freeman's Organic Farm Stall is located just across the road from Viria Retreat, and is fast becoming the place to be on Sunday, with live music from 10 am to 2 pm, adding to the atmosphere as you enjoy breakfast, organic coffee and the delicious cakes on offer. At other times, you can pick up your organic fruit and veggies as you take in the sweeping views from Mt. Cougal to the ocean. Currumbin Valley Rock Pools are a long time local favourite for a dip on long, hot summer days, with rock "slides" worn smooth by generations of coasters' enjoying the refreshing waters, and where kids can spend hours exploring the pools and rock formations. Public toilets, BBQs and picnic tables are also available, at the adjacent grassy field. It's ideal for a lazy midweek or weekend break with or without a packed picnic. 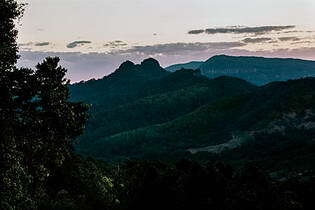 While most of the section is untracked and mountainous, a day picnic area at "Cougal Cascades" provides car parking, picnic tables, public toilets and a sealed walking track suitable for wheelchair access, with a number of viewing platforms, along the Currumbin Creek toward its headwaters. Further along the track are the restored remains of an old sawmill dating from 1914. Access to the creek is strongly discouraged as several people have died or suffered serious spinal injuries after jumping or diving in this water. Access is available via Tomewin (Murwillumbah) and the Currumbin Valley (Gold Coast) only. Arthur Freeman Lookout The Arthur Freeman Lookout on the QLD side of the border and Elliott Gruner Lookout on the NSW side provide panoramic views of these two valleys, while the border fence in "No Man's Land", which is still maintained for cattle tick control purposes, allows for an easy walk along the NSW/QLD border from lower Tomewin to the Border Gates. A bicycle ride from Tomewin through Bilambil, along Urliup Rd and back to Tomewin from the outskirts of Murwillumbah is a ride can be undertaken by competent riders of average skills and fitness. It takes between 2 and 5 hours depending on fitness levels and your desired pace. Getting here. Tomewin is on the New South Wales (NSW) Queensland (QLD) border, about 15 Kilometres (klm) north of Murwillumbah (NSW), and 20 kilometres from Coolangatta (QLD). It's 831 klm - about 10 hours drive north from Sydney, and approximately 100 klm - about 75 minutes drive south from Brisbane, via the Pacific Motorway. Driving options include the Tweed Valley Way or Summerland Way via Murwillumbah in New South Wales, and the Tomewin Mountain Road via the Currumbin Valley on the Gold Coast, and Pacific Motorway from Queensland. Domestic flights operate from all capital cities to Gold Coast Airport at Coolangatta, with a number of international carriers servicing SE Asia, New Zealand and the Pacific also offering regular services. Daily airport transfer services between Gold Coast Airport and Brisbane International Airport, are available to selected localities in the region, with some shuttles also going to Ballina/Byron Gateway Airport. Airtrain services between the Gold Coast and Brisbane are avialable from Robina. Daily interstate coach services are available from Coolangatta and Murwillumbah to Brisbane, Sydney and Melbourne, and daily or overnight train service is available from Sydney to Brisbane via coach transfer at Casino. Visit Tomewin - Transport Services Information for more transport information, including trains, coach and local bus schedules, taxis, airport, and transfer services.